State Attorney has until 3 p.m. to inform High Court that every object has been removed from Ayelet Hashachar synagogue. 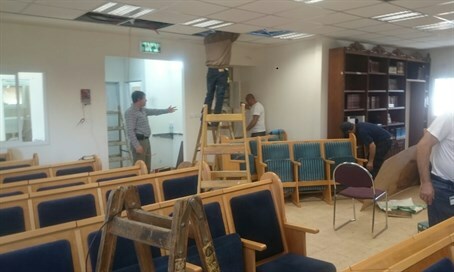 Construction workers employed by the Defense Ministry are now completing the establishment of a new temporary structure to replace the Ayelet Hashachar synagogue in Givat Ze'ev. The full contents of the Ayelet Hashachar synagogue were moved to the new site on Wednesday, as part of a deal reached by congregants and the Israeli government after the synagogue was slated for demolition. On Sunday, representatives of the government - headed by Ministers Moshe Ya'alon, Naftali Bennett and Aryeh Deri - the Givat Ze'ev Regional Council head, the synagogue's rabbi, and a representative of the synagogue's congregants reached a compromise over the demolition, in which a new building was promised to the synagogue within three months and a temporary structure provided. Another meeting Monday with all parties involved yielded an agreement for the synagogue to be evicted peacefully, and for all the constituents to leave of their own will - and to ensure that every object had been removed from the building. To this end, the date for demolition was set for Thursday - with no postponements allowed later than some three weeks from now, December 10, 2015. A security detail will be posted to the site 24/7 until the demolition ends, ensuring no one can enter the building. The High Court postponed the demolition on Tuesday, but it will likely be carried out within the agreed upon three week time frame. At 3:00 p.m. the State Attorney's Office will inform the High Court if the state has met its obligation to liquidate the synagogue and if the final dismantling of the structure can begin.